Initially, I gave this 5 stars, but once I really thought about it I just couldn't give it that. After thinking it over, I'm going to go with 4.3 Stars. My Coho fix started with Hopeless, and I thought she's pretty good, I need to read some more by her. I loved, and I mean really loved Maybe Someday. It's easily one of my top five books ever. Ugly Love, while good; did have some sketchy parts, but overall I really liked it. Confess...well I devoured it, I always do with any CoHo book. She has a way with words, they just flow off the pages. 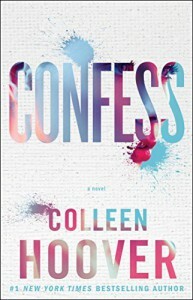 I also love the unique aspects she puts into her books, like the music in Maybe Someday and the art in Confess. I'm still working on reading Slammed, which has poetry. They were some really interesting aspects to this book, that I did enjoy. His paintings/confessions or maybe I should say confessions/paintings. The secret that Auburn has, Owen Cat, and of course, the tent. The ending just seemed rushed and really, so did the rest of the book. I think I just needed more "getting to know you" time from Owen and Auburn. I listened to this on Audio, with narration by Elizabeth Louise and Sebastian York. They did a commendable job and I'm not disappointed that I listened on Audio, rather than reading. For some reason I thought I might be, maybe, because I consider CoHo to be one of my favorite authors.